We carry a pet grilles to fit almost any size door, if we don’t have it in the size that fits your door, we can order it. 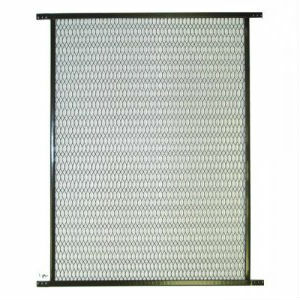 The screen door pet grilles are made out of steel and come in three colors, a bronze, white, and aluminum color. They are applied to the outside of your screen door using self tapping screws. The screen door grille covers the bottom half of the screen door (about 33 inches in height). The grilles protect your new screen door screen from getting damaged if your dog or cats jump up on the screen door while outside. Our pet grilles are great for keeping your screens protected to last longer. Another option is adding a doggy door or pet door into your screen door (the small pet door size is the a good size for a cat) along with a pet swinging screen doors if the door does not have enough protection. grille to allow your pet to go outside while keeping your screen safe and the bugs outside. 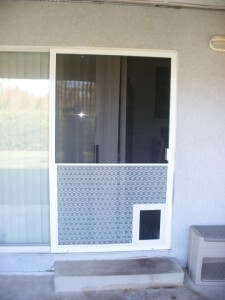 We can incorporate a doggy door and a pet grille together on the same door. Please ask for details.